Tanks - Underground Water Tanks - Fiberglass Tanks - Rain Harvesting Supplies, Inc.
Water harvesting captures, diverts and stores rainwater for later use. With proper planning and design, your system can be built to capture up to 100% of the surface area rainwater. 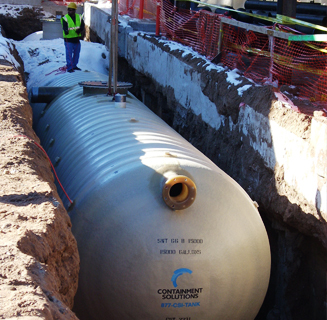 Flowtite fiberglass tanks can store wastewater, graywater, rainwater, stormwater, even potable drinking water. The tanks can also be fit with filtering components to separate oil and other contaminants so the rain collected can be reused for landscaping and other applications. Rainwater harvesting captures, diverts and stores rainwater for later use. Natural rainwater is very clean and therefore needs little filtering to be used as a secondary water supply. Rainwater harvesting is an innovative approach anyone can use. With proper planning and design, your system can be built to capture up to 100% of the surface area rainwater. Rainwater harvesting can make a dramatic impact through financial tax incentives, compliance with current and future regulations and additional credits toward certification of building. Newer applications include recharging cooling tower water supplies for evaporative cooling systems. Tank sizes and accessories can be customized to meet both residential and commercial design plans. In many rural areas of the world water can be scarce where annual rainfall is low. Although stormwater is a proven water collection source for these abnormally dry rural communities, similar water shortages can occur in urban areas as well even where average rainfall amounts should be sufficient. Urban development introduces impervious surfaces to an environment, which prevent stormwater from soaking into the ground. Common impervious surfaces include parking lots, highways, rooftops, etc. These surfaces cause runoff water to funnel through waterways and out of the city too quickly to be absorbed naturally. The result is a unique situation where areas with average rainfall suffer from flooding during normal rains and unnecessary drought conditions during expected dry periods. The solution of course is to collect and store the flooding water for drier times. Collecting stormwater often begins with storm drains built directly into streets and parking lots. These drains would then channel the water to a Flowtite stormwater tank. With the proper accessories attached to your storage tank, collected water can be filtered and reused in both indoor and outdoor applications thus minimizing overall potable water use.